*The review is solely based on my religious beliefs. May differ from yours which I respect and do not wish to discuss save only from what you have to say about the book. I was an emotional b*tch while reading this in public transport. I understand that religion can be really sentimental and plays the chord of your heart like no other but I’d really like to get over my sentiments to make most out of the rational part. So, it was pretty hard for me to not remain teary eyed in the initial chapters on the beloved Prophet Muhammad (May thousands of blessings be upon him). The split of Sunni-Shia is a subject which isn’t a new one and though many stories and facts are heard about it, no single reason is ever drawn. After reading this book, I can say it was all due to the result of an over possessiveness of a jealous wife and the devotees of the Prophet. The book is a somewhat biased factual record of the history and if there was anything, it inspires in your life all the goodness that is in Islam and gets to the bottom of certain laws and events which always were doubtful or needed explanation on the subject. The fact is much more blood could’ve been saved to run a gush in the battle fields had the Prophet decided whose side he was on (according to the book). Much as was the Prophet unable to decide whether to be biased towards his loving wife or his own blood, Muslims too are torn between their love for the Mothers of the Faithful and the Ahl-e-bait. 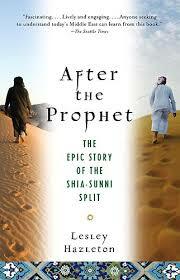 The external factors and much of the incidents were a real eye opener and the split’s lineage to the current political situation of the middle east with reference to Sunni- Shia split was very knowledgeable too but though I thought it to be unbiased, in the end almost all of the accounts are from the Shia texts leaving little room for the Sunni’s less than no accounts of the events whatsoever. The book is a summarized version of the events as it happened so many of the details are voluntarily omitted. Not a minute while reading this book did I ever yawn or got bored of the text, interesting and full of zest as it was, kept me on the toes. The thoughts of an easily distracted writer. A person of female gender running, reading, writing & generally trying to avoid eating too much in a city of food.